Skrillex has unleashed a new set of visuals for his rabid fanbase that we simply had to share with you. Click below to view the official video for “Rock N Roll (Will Take You To the Mountain).” If you like what you hear, be sure to keep in touch with Skrillex on Twitter. 3OH!3 have posted a clip of a new song entitled “Robot.” The song will be available for digital download on June 28th. Check out the clip below and let us know what you think. Lucas Carpenter has posted the acoustic version of a new song entitled, “Little Bit Loved Out” for his weekly installments of videos. You can hear the new song below and if you like what you hear, ‘like’ his facebook. Check out Rise Against‘s new music video for “Make It Stop (September’s Children)” right here on UTG. This song is off of the group’s latest release, Endgame. 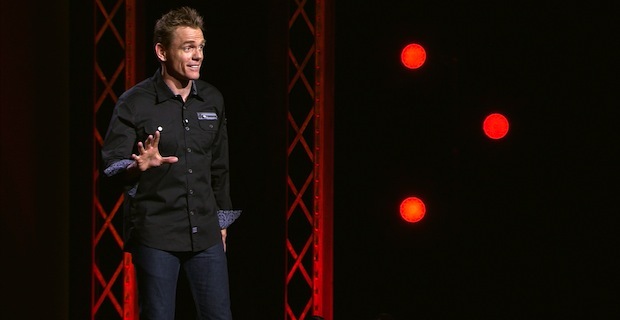 Stand-up Tuesdays returns with a spotlight on comedian Christopher Titus and his latest special, Neverlution. If you think you loved his work before, get ready to fall head over heels all over again for this comedy mastermind. Click through now! Set Your Goals have given us something to look forward to over at Amazon. Listen to 30-second clips of every song off of Burning At Both Ends by clicking right here. If you like what you hear then please pick it up when it hit stores and everywhere on June 24. Drake has loosed another track with no apparent source or destination. Click below to stream the freaking fantastic “Trust Issues” and feel free to grab a copy for yourself as well! Take Care, which this song may or may not be on, hits stores in October. Incubus guitarist Mike Einziger sat down and discussed the meanings behind all of the tracks off of the bands’ forthcoming release, If Not Now, When?. The album is released on July 11 through Epic Records. Go and read this in-depth guide to their album by clicking right here.